This how to make rock candy tutorial shows you how to make a tempting cinnamon rock candy that you will want to make year after year! Rock candy made from this recipe can be easily combined in a pretty mason jar for personal holiday and teacher gifts that everyone will appreciate. Whether you’re looking for a quick and easy holiday or hostess gift or you’re interesting a kitchen science lesson, rock candy is super fun to make and eat! This deceptively simple to make homemade cinnamon rock candy DIY will be the gift that keeps on giving and is made with the heart. And don’t fret- this “how to” is all you need to learn how to make rock candy fast – any flavor or color you like! Create cinnamon rock candy and peppermint rock candy with this Cinnamon Rock Candy Recipe! As making rock candy at home is one of the best things to give around the Christmas holidays, if you keep the ingredients on hand, you can whip up a batch on the fly for those last-minute gifts or get-togethers. 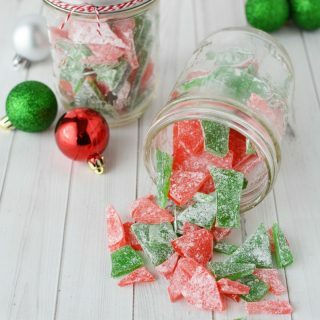 To keep it festive, this rock candy recipe below includes a peppermint (green) version and a Cinnamon (red) version. You can easily add them both to separate mason jars or combine for a bit of delicious fun no matter which one you grab. Of course, handing out any type of dessert over the holiday is a win for your guests. 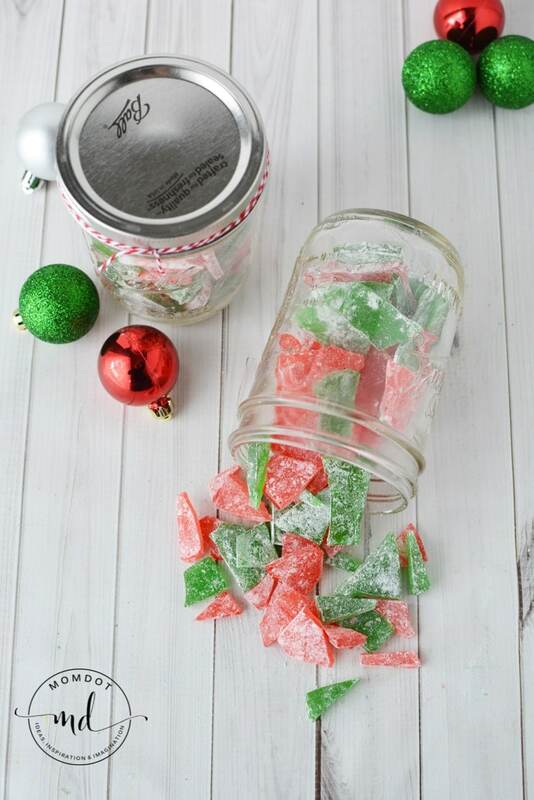 I also love to make Christmas Crack and this rock candy and fill some pretty tins to the brim – so combine that recipe and this one to get your holiday cooking and baking really going this season. You absolutely need a candy thermometer when making this. 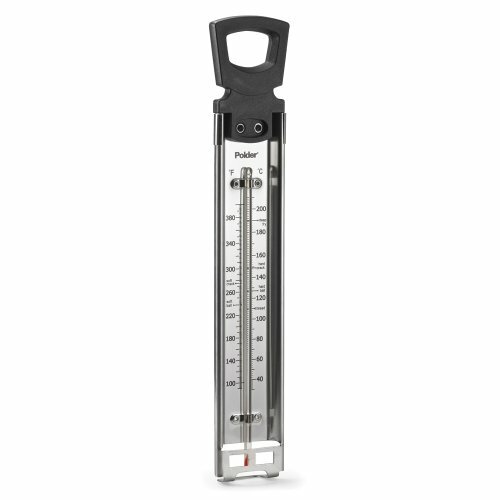 Only the most experienced candy makers can really eyeball the mixture for the right temp, and even the professionals use a thermometer. You’ll find lots of uses beyond just making candy – frying especially! They are inexpensive, and you don’t need something super fancy. I highly recommend you spray your measuring cup with cooking spray before adding corn syrup. It won’t stick in the measuring cup. 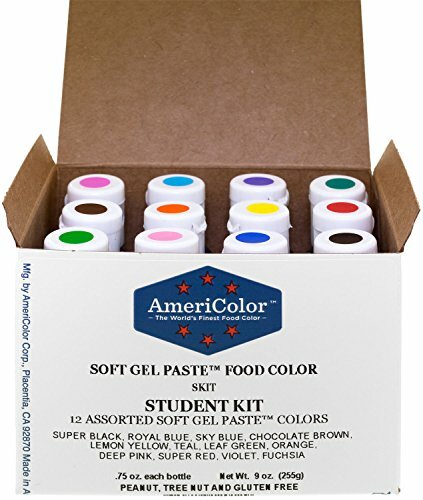 I use Americolor soft gel paste for these colors: 111 leaf green and 119 red red. 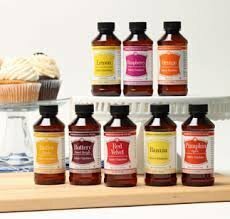 I used LorAnn Flavorings in Peppermint and Cinnamon. You need 1 entire flavoring bottle per recipe. This rock candy recipe is not hard to make, but it takes time. A good 20-30 minutes on the stove to get it to temperature and you cannot rush candy making! Please note that the homemade candy recipe below is per color and flavor. You will need this recipe for every color or flavor you choose. A good 20-30 minutes on the stove to get it to temperature and you cannot rush candy making! You also need to commit to being on hand while you make the candy – it can turn on you in a flash so be prepared to babysit this recipe. Grease a 15x10x1″ baking sheet with nonstick cooking spray and set aside. This is a standard jelly roll size. Feel free to use any cookie or sheet pan you have but make sure you have plenty of space for all the candies to cool. In a large saucepan, add sugar, water, and corn syrup and mix well. Attach a candy thermometer onto the edge of the pan. Heat over medium heat constantly stirring until sugar dissolves. 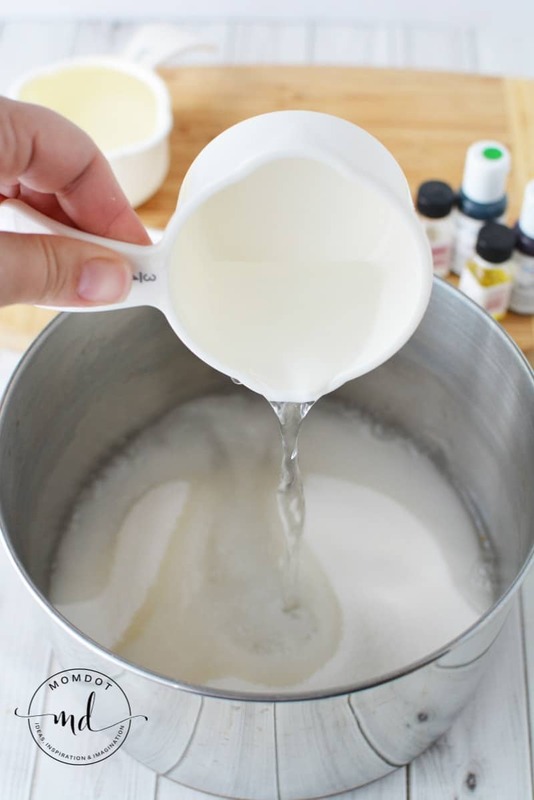 Once sugar is dissolved, stop stirring and let the mixture boil. Continue to boil until the temperature reaches 250 degrees F.
Do not stir; the boiling will mix the color. When mixture comes to 300 degrees F, remove from heat and let cool slightly. Once no longer boiling, add flavor and gently stir. Use caution as the mixture will bubble up. Let set, and the bubbles will disappear. Tip: Boiling sugar is incredibly dangerous. Make sure you are careful not to get even one drop on your skin and that children stay safely back. When the candy has cooled to room temperature, break it into pieces. My favorite method is to smash it with a heavy pan or skillet against a hard surface. To protect the sheet pan and my counter, I usually do this over a large cutting board. Break apart any large pieces and place into a sealable bag with 2 tablespoons of powdered sugar (add more if necessary). Shake bag to coat well. Remove from bag and pack for gifts or enjoy it yourself! You can store the candy at room temperature for up to a week in a plastic bag or container, but I don’t really think you’ll have it sitting around that long. 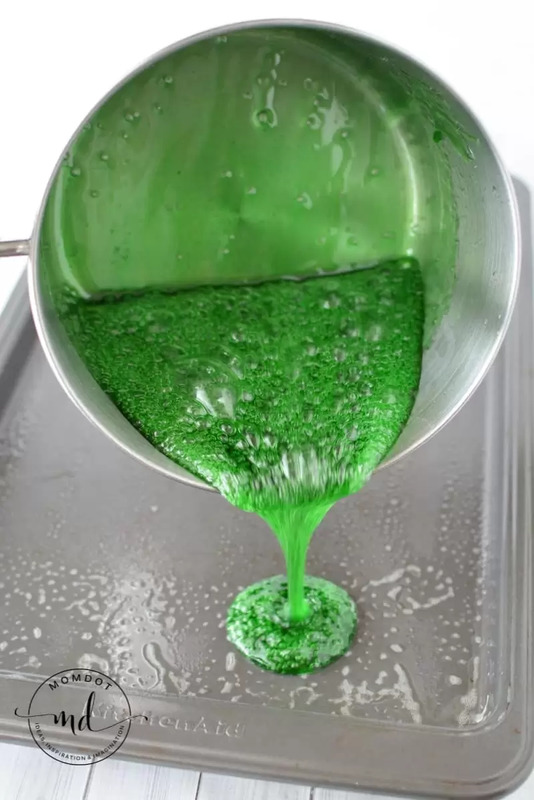 If you want to make two colors or flavors, repeat the above steps for the second rock candy color/flavor. Grease a 15x10x1" baking sheet with nonstick cooking spray and set aside. In a large saucepan, add sugar, water and corn syrup and mix well. Attach a candy thermometer onto the edge of the pan. Once sugar is dissolved, stop stirring and let mixture boil. Continue to boil until the temperature reaches 250 degrees F. Add color. Do not stir, the boiling will mix the color. When mixture comes to 300 degrees F, remove from heat. Once no longer boiling, add flavor and gently stir. Use caution as the mixture will bubble up. Pour into prepared pan. Let set and the bubbles will disappear. When cool, break into pieces by dropping pan onto a hard, flat surface. Beak apart any large pieces and place into a sealable bag with 2 tablespoons of powdered sugar (add more if necessary). Shake bag to coat well. Remove from bag and enjoy. Store in a resealable container or bag. This cinnamon rock candy is a perfect recipe for homemade gifts! Make sure you have all your ingredients and your kitchen utensils prepped, as working with hot candy needs concentration. You say two seperate time to add the color…I think one of those time was supposed to be the flavor. Also, you say you need an entire bottle of the flavor per recipe, but then say it’s 1 teaspoon of flavor. Natalie, you are right, I doubled added the word color. The second should have been flavor! Regarding the tsp, the bottles of flavoring are approximately 1 tsp, some are a dram that are 3/4th tsp. I updated the recipe to just be consistent and say bottle so the exact measurement doesn’t get lost in translation. Thank you!